Until 2015, it was not known whether icy Pluto or its largest moon, Charon, had mountains, valleys or even impact craters. After the spectacular success of New Horizons in July 2015, scientists were amazed at the towering peaks and deep valleys that were revealed in the returned data. Now, thanks to the efforts of the New Horizons team, the first official validated global map and topographic maps of these two bodies have been published and are available to all. The maps and the process of creating them are described in two new research articles published in the journal Icarus. To create the maps, New Horizons researchers, led by Senior Staff Scientist, Paul Schenk, at the Lunar and Planetary Institute, registered all the images from the Long Range Reconnaissance Imager (LORRI) and Multispectral Visible Imaging Camera (MVIC) systems together and assembled the mosaics. This was a labor-intensive effort requiring detailed alignment of surface features in overlapping images. Digital analysis of stereo images obtained by both cameras were used to create topographic maps for each region; these were then assembled into integrated topographic maps for each body. These new maps of Pluto and Charon were produced painstakingly over a two-year period as data were slowly transmitted to Earth from the New Horizons spacecraft. The quality of geographically and topographically accurate maps improved with each new batch of images that were returned to Earth. The topographic maps also reveal large-scale features that are not obvious in the global mosaic map. The ice sheet within the 1000-kilometer (625-mile) wide Sputnik Planitia is on average 2.5 kilometers (1.5 miles) deep while the outer edges of the ice sheet lie an even deeper 3.5 km (or 2.2. miles) below Pluto's mean elevation, or 'sea level' surface. 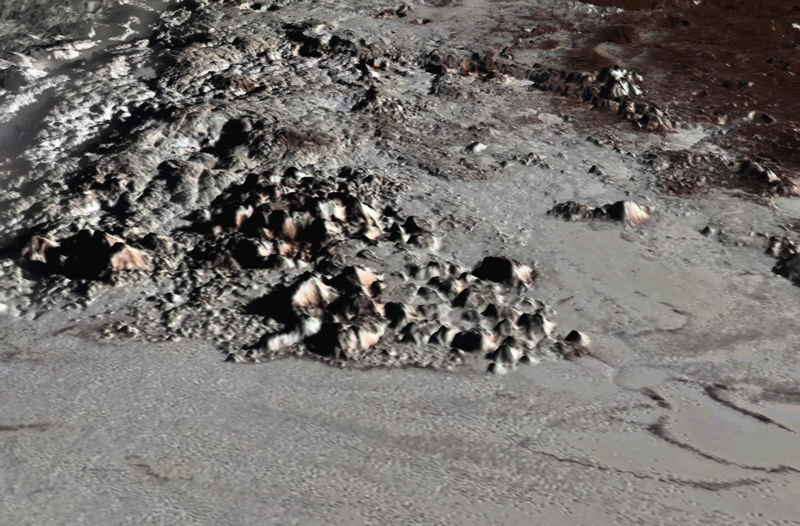 While most of the ice sheet is relatively flat, these outer edges of Sputnik Planitia are the lowest known areas on Pluto, all features that are evident only in the stereo images and elevation maps. The topographic maps also reveal the existence of a global-scale deeply eroded ridge-and-trough system more than 3000 kilometers (or 2,000 miles) long, trending from north-to-south near the western edge of Sputnik Planitia. This feature is the longest known on Pluto and indicates that extensive fracturing occurred in the distant past. Why such fracturing occurred only along this linear band is not well understood. On Charon the topographic maps also reveal deep depressions near the north pole that are ~14 kilometers (8.7 miles) deep, deeper than the Marianas Trench on Earth. The equatorial troughs that form the boundary between the northern and southern plains on Charon also feature high relief of ~8 kilometers. The mapping of fractured northern terrains and tilted crustal blocks along this boundary could be due to cryovolcanic resurfacing, perhaps triggered by the foundering of large crustal blocks into the deep interior of Charon. The rugged relief also indicates that Charon retains much of its original topography caused by its history of fracturing and surface disruption.